7 Days Marangu Route | . Mount Kilimanjaro Climb through Marangu Route is the easiest and most popular route to the summit, the Marangu Route is used by almost 50% of all climbers and uses comfortable mountain huts with solar power light and it is also suitable for those adventure tourists who don’t have much experiences climbing the mountains, therefore classified as a moderate trek rather than a climb. Although the trail can be a little crowded a certain time of the year, the views are beautiful and each day of walking progresses through a different climate zone, adding considerably to the interest of the trekking. The total time during the mountain climbing will be 5 days on Marangu Route. 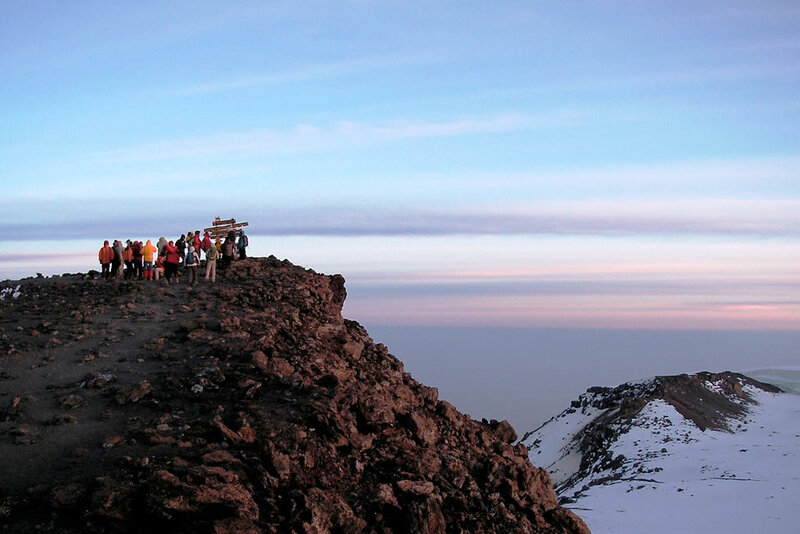 The real highlight for those who opt for Marangu Route is the walk from Gillman’s point along the crater rim to the summit of Uhuru, passing close to the spectacular glaciers and ice cliffs that occupy most of the summit area. The views as the sun rises behind Mawenzi Peak on a clear morning are absolutely magnificent –The Rift Valley, Mount Meru and the Maasai Steppes stand out from the endless plains, almost three vertical miles below. The National Park Gate (1,830 m) lies at the edge of Marangu, which is an attractive village with many small coffee and banana plantations. After completing the entrance formalities, we climb up through attractive and unspoilt forest to reach the clearing containing Mandara Hut (2,700 m.), a group of comfortable ‘A’ frame wooden huts. The largest cabin has a downstairs dining area and an upstairs dormitory and mattresses. Smaller huts sleep eight persons. The total capacity is sixty persons. Water is piped onto site from a spring above and there are flush toilets behind the main cabin. The volcanic remains of Maundi Crater are nearby and make a good afternoon excursion. An alternative is to rest and enjoy the beautiful forest. There is a rich birdlife at the huts and monkeys are often seen as well. It takes about 3–5 hours walk. After breakfast Aardvark Expeditions Team can organize a private departure transfer on request to Arusha Airport or to Kilimanjaro International Airport for your flight back home or flying to Zanzibar Island. Price cost US$ 1,540 per person. Price cost US$ 1,495 per person based on a group of 5 people onward. An extra day on the mountain cost US$ 320 per person per day.